Following the passage of the Federal Tax Cuts and Jobs Act in late 2017, the Connecticut legislature attempted to modify Connecticut estate tax law and make it more consistent with the new, much higher $11.2 million federal basic exclusion amount for each individual (which is scheduled to sunset in 2023). Unfortunately, two Public Acts passed during the 2018 legislative session which attempted to address this issue have not settled the status of estate tax law in Connecticut. For example, under this Act if you were to die in 2020 with a Connecticut taxable estate less than $5.1 million, no Connecticut estate tax would be due. In general, the tax rates that will apply to estates with assets in excess of the exempt amount range from approximately 7.2% to 12%. 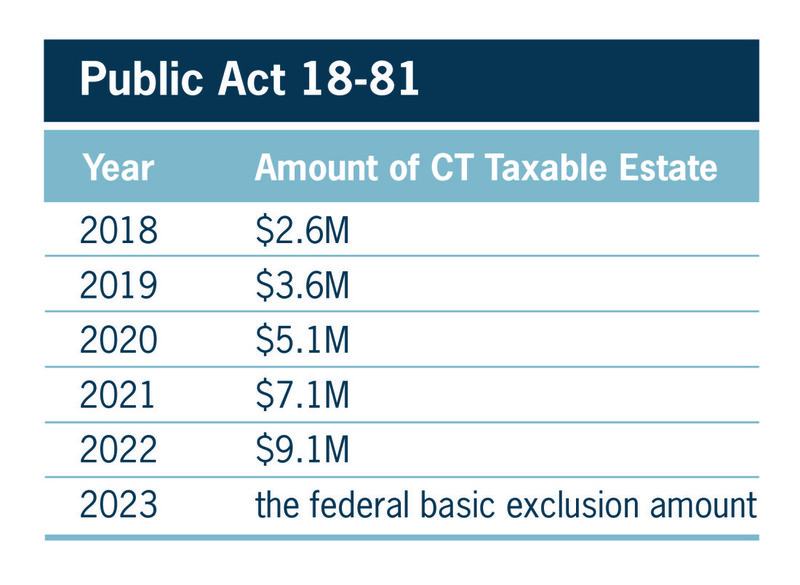 The second bill, Public Act 18-49, signed into law May 31, 2018, provides a different table that only increases Connecticut’s estate tax exemption to $5.49 million for 2020 and thereafter. According to this law, there will be no further increases in the Connecticut estate tax exemption after 2020. Based on conversations with the Connecticut Office of Legislative Management, it is our understanding that this result was an unintended "glitch" and will be corrected by the legislature when one of the bills is codified in late 2018 or early 2019. Given the inconsistencies between the bills, however, it is also possible that the entire debate regarding increases to Connecticut’s estate tax exemption could be reopened before either of the Acts is codified. The gift tax exemptions under each Act mirror the respective Act’s estate tax provisions. Consistent with current law, both Acts allow an estate tax credit for any gift tax previously paid to Connecticut. In any event, the recent federal and state legislation increasing the values of estates which are now effectively exempt from estate taxes (at least until 2023 under current law) represents a positive tax change for individuals, and an opportunity to transfer substantial amounts of wealth estate-tax free. Since many estate plans were put into effect when the exempt amounts were much lower, a review of your estate plan in light of these federal and Connecticut developments may well be advantageous to you and your family. Our Trusts and Estates Attorneys welcome your questions about how these new tax laws may affect your estate plan.